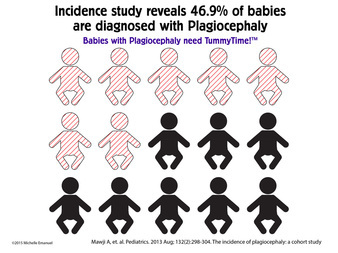 TummyTime!™ is a Gold Standard treatment for Torticollis and Plagiocephaly. It is a bidirectional, reciprocal activity where the TT! Professional empowers and equips parents to be attuned and coregulated during this playtime activity. The ultimate goal of TT! Method is NOT to rush acquisition of developmental milestones or to rush a baby through a certain stage of development....nor is the point to just get baby into the "position" of "tummy time". TummyTime!™ Professionals are trained to teach parent/baby classes as well as use the Method in one-on-one sessions. There is an emphasis on empowering and equipping parents with the TT! Method. Disclaimer: TummyTime!™ Professionals do not have permission or sufficient training to teach the TummyTime!™​ Method to other professionals. After attending the two-day TummyTime!™ Method training, you are eligible for certification after meeting the following certification requirements (Certification NOT available through Cranial Nerve Dysfunction training). Include: Name, age, baseline tummy time status. Photos and videos suggested. Click above to join the Professional Resource and Support Group. This is an additional benefit to becoming certified in the TummyTime!™ Method. Upon completion of the TT! Method training you will have full access to online support and resources from Michelle and other certified TT! professionals.